This May 4th article is an exciting follow-up to a February Register-Guard article announcing an attempt by Christopher Pike and Maikey Lopera of Eugene, together with Eric Noll of Seattle, and Federico Pisani and Marcus Tobias of Venezuela, to circumnavigate the 1,300 mile shoreline of Siberia’s Lake Baikal – in winter. The Bailey Hill Road Safety Plaza will be built near the Bailey Hill crosswalk which was built last summer. Unfortunately, our next story changes the tone of this wrap-up from crazy adventure to hard-life reality. Automobiles are dangerous, and sometimes drivers kill people. 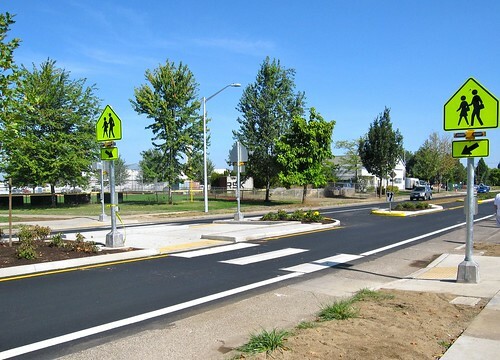 This May 5th Register-Guard article details the creation of the Bailey Hill Road Safety Plaza, an educational memorial dedicated to lost loved ones – including David Minor, 27 – killed June 2nd, 2008 while biking on Willamette St.; Vaclav Hajek, 10 – killed August 27th, 2007 while crossing Bailey Hill Road; and Jane Higdon, 47 – killed May 31, 2006 while cycling on Territorial Highway. Hajek and those who have worked on the project want to reach out to other families who have lost children and loved ones in motor vehicle collisions, the leading cause of death for youth in both Oregon and nationwide. They are asking local families to come forward and contribute photographs of their deceased children and loved ones for the June 8 dedication of the memorial plaza, which will be built to form a semicircle on a spot of grass that now lies beyond the softball field that is part of the Churchill Youth Sports Park. Students from Mc­Cornack Elementary School, where Vaclav attended, met three times in March and April at the Churchill High library to come up with more than 80 safety phrases to put on the memorial plaza’s sign. Phrases such as, “Speeding’s not cool, so follow the rules,” and “One careful look, one careful drive, can save many lives,” and “A car’s a car, don’t go as fast as a shooting star.” About a half-dozen phrases will be selected. The side of the sign facing the road will read, “Start Seeing Everyone” with the logo of “Eye to Eye,” a national campaign that promotes awareness and respect for shared paths and roadways. The other side will say, “What’s the No. 1 cause of death for Oregon youth? It’s not guns â€¦ it’s not drugs â€¦ it’s not cancer â€¦ It’s motor vehicle crashes. Be Seen. Be Safe. Please Drive Carefully.” The sign will feature a graphic of the state of Oregon, filled in with photographs of McCornack students who contributed their phrases to the project. Please read the full article for more information and a time-line of the project. It’s unclear from the article if they will be taking the Adventure Cycling Lewis and Clark Trail, or hashing out their own route based on the original expedition. I sort of think they are taking Adventure Cycling route, because both routes are listed as being 3,253 miles, and that would be a very silly coincidence if the two routes weren’t the same. What I do know is that they are going self-supported, which is awesome, and that I wish I had a high-school teacher as cool as James March when I was a young lad. The article is not very long, and as much as I’d like to just quote the entire thing here – I don’t really want to get into a copyright battle with “The Leader in Industry News.” As such, you should just go there to read the full article. Oh, from what we learned, it will be the Adventure Cycling route. “Does This Count As My Senior Project? The Springfield High Cycling Club is busy preparing for an epic bike tour of the historic Lewis and Clark Trail. Two teachers and six students plan on taking 50 days to complete the 3,200 mile trip that starts in St. Louis Missouri and ends in Seaside, Oregon. They are currently accepting both monetary donations and used gear in preparation for the journey. Okay, so it doesn’t say anything about at AC route… but I’m pretty sure I read that somewhere. Next Next post: Bike Music Festival and Group Rides: Post Your Pictures and Video!